But this year, before making any elaborate plans to view the annual Geminid display, prospective skywatchers should be aware they will be facing a major obstacle to observe this year's Geminid performance, namely the moon. Unfortunately, as luck would have it, 2011 will see the moon turn full on Dec. 10, seriously hampering, if not all but preventing observation of the peak of the Geminids, which is predicted to occur the night of Dec. 13 and morning of Dec. 14. Bright moonlight will flood the sky through much of that night and will likely wreak havoc on any serious attempts to observe these meteors. As a consolation prize, though, the full moon will be in total eclipse Dec. 10, visible in North America, Asia, Alaska, Hawaii, Australia, New Zealand. This year's Geminids have already begun, though so far they've been weak and scattered throughout this month. But a noticeable upswing in Geminid activity is occurring, leading up to their peak next week. For those disappointed about the poor conditions for Geminid viewing this year, it should be noted that every once in a while, a dazzling Geminid fireball will blaze forth, bright enough to be quite spectacular and more than capable of attracting attention even in bright moonlight. In their book, "Observe Meteors," published by the Astronomical League, astronomers David Levy and Stephen Edberg note, "If you have not yet seen a mighty Geminid fireball arcing gracefully across an expanse of sky, then you have not seen a meteor." With this as a background, perhaps the best times to look this year will be during the evening hours following the night of full moon. That's when the constellation Gemini (from which the meteors get their name) will be rising above the east-northeast horizon. In fact, early on Tuesday evening, Dec. 13, there will be a short window of opportunity to look for Geminids in a dark, moonless sky. Between the time that twilight ends and the time that the bright waning gibbous moon rises, there will be about an hour of dark sky available. For most locations, moonrise is around 7:30 p.m.
On Wednesday evening, Dec. 14, moonrise comes about an hour later, at around 8:30 p.m.
During those moonless intervals, there may be an opportunity to catch a glimpse of an unusually beautiful type of meteor called an "Earthgrazer." Earthgrazers are long, bright, shooting stars that streak overhead from just below the horizon. They often display colorful halos and long-lasting trails. Earthgrazers are distinctive because they follow a path nearly parallel to our atmosphere, analogous to a rock skimming across the top of a pond. The Geminid radiant, from which the meteors appear to originate, is near to the bright star Castor and will be close to the horizon as our planet is passing through the Geminid stream. 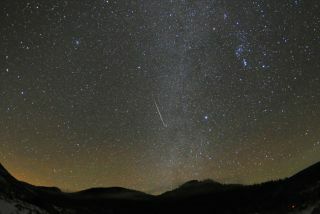 In the absence of moonlight, a single observer might see upwards of 120 meteors per hour on the peak night of the Geminid meteor show, a number that, sadly, cannot be hoped to be approached in 2011. Looking ahead to 2012, though, the Geminids will reach their peak on the night of a New Moon, meaning viewing conditions will be perfect.